It started as a crazy idea and has grown to become the largest biathlon event. The cross-country course – between the Winterdorf (Winter Village) and the stadium – is around 200 meters long. Passing cheering, celebrating and encouraging biathlon fans. Followed by a camera on rails, and with only a slight chance of passing (the opponents), since the snow-covered course is only four meters wide. The best part is still to come: after a sharp right curve, (the athletes) enter a tunnel almost 100 meters long. All of a sudden, silence. Colorful „darkness“ – the tunnel is lit with multi-colored spotlights. The closer one reaches the tunnel’s exit with powerful thrusts, the louder the background noise gets. And then one enters the largest biathlon arena in Germany, perhaps even worldwide. These world-class biathletes will raise to the challenge of the Biathlon World Team Challenge (WTC) for the eleventh time this upcoming December – not somewhere in the biathlon strongholds of Scandinavia, Siberia, the Alps or in Thuringen, but in one of the biggest metropolitan areas in Europe. Right in the the middle of the „Ruhrpott“ (the Ruhrgebiet), the region that has developed, or is at least working hard to do so, into the „Ruhr Metropole.“ In the Veltins Arena „auf Schalke“ (on/at Schalke) – where FC Schalke 04’s footballers normally play their home matches in the German Bundesliga or in the European Cup. In a stadium that, thanks to it’s impressive multifunctionality, can be turned into an ice hockey arena, a handball hall or a concert auditiorium in a matter of days. Herbert Fritzenberger came up with the idea for the biggest biathlon event in the world, and it was initially held in Ruhpolding. The television broadcasters were looking for an entertaining tv format that could be held „between the years.“ And the former biathlete and cross-country skier (amongst others, World Championship Silver with the 1989 team) came up with the Mixed Relay Competition as an unofficial world championship. Up to 5,000 live spectators and two million tv viewers followed these racing invitational in the 90’s. Herbert Fritzenwenger was visiting Bottrop in 2001 in order to check out the brand new ski hall built on the site of an old coal-mining slag heap. What he saw there was very impressive. But even more impressive, according to him, was the nearly completed Schalke Arena a few kilometers down the road. His line of thinking: the Biathlon WTC needs to take place here. A crazy idea that was initially only met with scepticism. Schalke’s manager at the time, Rudi Aussauer, was also a sceptic at first but quickly became enthusiastic and gave his team the task of implementing (the idea). The premiere „auf Schalke“ on December 28, 2002 was a success in every aspect: 35,000 biathlon fans in a sold-out Veltins Arena – almost 20,000 seats had to be initially blocked-off because of the shooting range – and, at peak viewing times, more than five million viewers on tv proved enormous interest. And that was justifiable, as an exciting, world-class competition, as well as a variety of supporting programs/acts coupled with a cozy winter village from 11 am – 8 pm in the evening, were the perfect mix. The Schalke Arena shook when it was announced that Martina Beck and Michael Gries were the premiere’s winners, ahead of Albina/Victor Maigourov (Russia) and Sanna- Leena Perunka (Finland). The concept was honed in the following years and the ambiance was optimized: the bark mulch that covered the concrete floor in the Veltins Arena (that got kind of mushy due to the melting snow, and did not look so nice on tv) has been replaced by a white carpet placed on hundreds of pallets, giving the impression of a snow-covered winter landscape, complimented by hundreds of fir trees from nearby Sauerland. And in order to increase the stadium’s capacity to more than 50,000, the shooting range has been enclosed by a bullet-proof glass in the mean time. Additionally, various suppliers of artificial snow were tested. 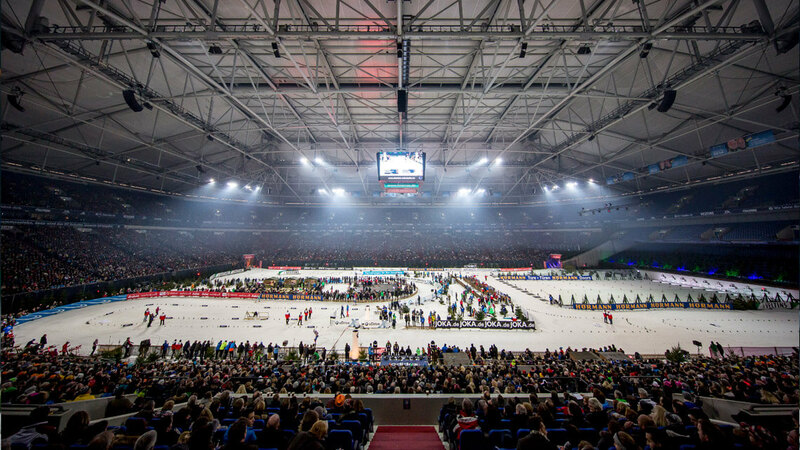 As a result, within one year, the starting gun went off in the Veltins Arena while the last meters of the cross-country course were being cordened off. In the mean time, a well-oiled partnership has been formed between operators of the Veltins Arena and the Neuss Ski Hall so that there are always optimal conditions for the biathletes on the +/- 1.2 kilometer long cross-country course. It became more challenging for the athletes; and, therefore, even more exciting for the spectators. The race now consists of two half-times – a mass start with the entire entourage in the first half and a pursuit race in the second half. And then some of the unqualified teams get the chance to qualify thanks to the tierd qualification system. Like Andrea Henkel and Michi Greiss at the last Biathlon WTC – they wound up in the end of the pack in the first half and then were able to fight for third place in the second half.